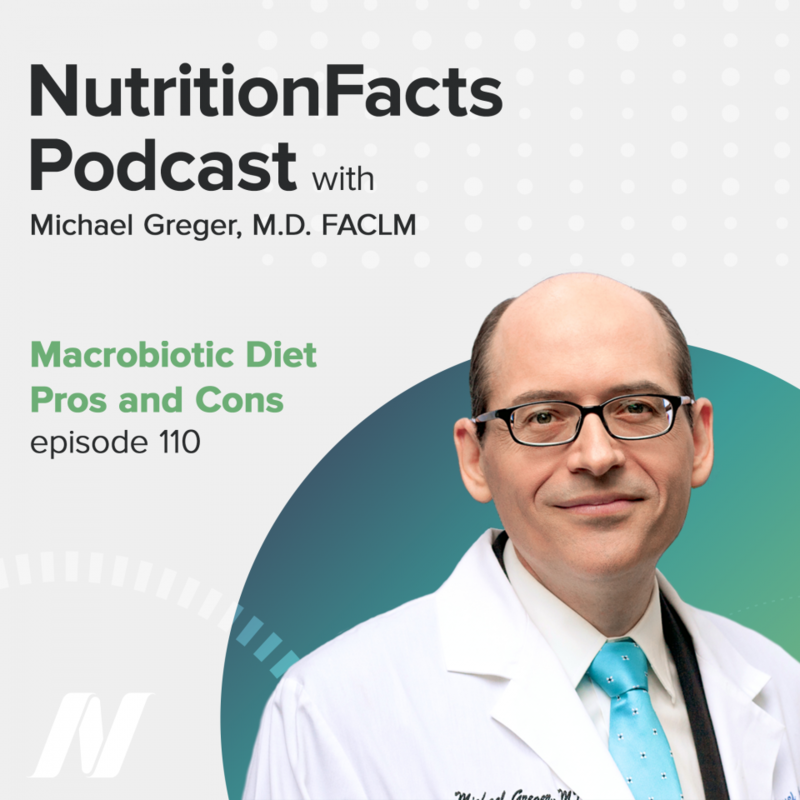 This episode features audio from Pros and Cons of a Macrobiotic Diet and Benefits of a Macrobiotic Diet for Diabetes. Visit the video pages for all sources and doctor’s notes related to this podcast. Welcome to the Nutrition Facts podcast. I’m your host, Dr. Michael Greger. I am thrilled that you have decided to join me today. Because the more I learn about the latest in nutrition research–the more convinced I am that this information can make a real difference in all our lives. And I like nothing better–than sharing it with you. Today we evaluate the macrobiotic diet – the original counterculture diet from the 1960’s. So, is it healthy? What about today’s macrobiotic diet? Let’s start with the pros and cons of a macrobiotic diet. Macrobiotic diets have been described by the American Medical Association as “one of the most dangerous dietary regimens, posing not only serious hazards to the health of the individual but even to life itself.” After all, macrobiotic diets are “predominantly vegetarian with a great emphasis…placed on whole grain[s].” What’s wrong with that? Well, they also used to tell people to not drink water, which isn’t good, and to avoid fruit—so much so it’s resulted in modern-day cases of scurvy. Now thankfully, “[t]he macrobiotic diet has evolved over the past 30 years–an emphasis on whole grains, vegetables, and beans, while minimizing most meat, eggs, and dairy. I don’t like them restricting fruits; don’t like all the added salt; but compared to the standard American diet, it’s got a lot of things going for it. Only a quarter of the saturated fat intake, less than half the sugar intake, a very respectable fiber intake, two-and-a-half times the national average, but actually taking in more sodium. So, while the macrobiotic diet is an anti-inflammatory diet—has a negative dietary inflammatory index score, as opposed to the pro-inflammatory American diet—some of the most anti-inflammatory foods are herbs and spices. So, instead of adding all that sea salt and soy sauce, the macrobiotic diet could be improved by using natural seasonings instead. Just three weeks on a strictly plant-based diet composed mostly of whole grains, vegetables, and beans and… they got about a 10% drop in blood pressure, a whopping 35% drop in LDL (bad) cholesterol, and a 38% drop in fasting blood sugars—in just 21 days. Were these changes statistically significant? Yes, the changes were significant in every possible way. Similarly, short-term interventional studies on diabetics with these so-called Ma-Pi 2 macrobiotic diets have been performed across four continents. The “Ma-Pi” comes from the guy that came up with the diet, Mario Pianesi, a strictly plant-based diet based mostly on whole grains and vegetables, with legumes and some seeds, and decaf green tea as the preferred beverage. A near 40% drop in fasting blood sugars; near 27% drop in LDL cholesterol in 21 days. Now, they did lose weight, a few pounds a week, but those kinds of results were way more than one would expect with weight loss, and—here’s the kicker—that 40% drop in blood sugars was after cutting their insulin in half! So those numbers greatly underestimate the effects. Better results, on fewer drugs. That’s the power of plants! All we need now is a randomized, controlled clinical trial to really seal the deal—which we’ll cover next. In our final story we look at what happens when you add massive amounts of carbs to the daily diet of type 2 diabetics in the form of whole grains. Why are macrobiotic diets apparently so effective at reducing blood sugar levels in diabetes, within just a few weeks’ time? Because the diet is centered around whole grains—brown rice, barley, and mille, maybe the high fiber intake is improving the gut microbiome, the friendly flora in the colons of diabetics, and that’s leading to a reduction in insulin resistance? Or, maybe because it also has lots of vegetables, maybe it’s kind of correcting some kind of low-grade acidosis from the high levels of animal protein in their regular diets? Regardless, this was after just 21 days. Can macrobiotic diets also help with longer-term blood sugar control? But then, they were placed on this so-called Ma-Pi 2 diet, a strictly plant-based macrobiotic-style diet centered around whole grains, vegetables, and beans, with some sesame seeds and green tea. What happened? A1c levels started out with a wildly out-of-control diabetic 12.6, despite daily insulin injections, and six months eating that diet, ended up averaging a non-diabetic 5.7. And, are you ready for this? That was after they all were able to eliminate their insulin! They went from 100% on insulin with out-of-control diabetes to 0% on insulin averaging non-diabetic blood sugars. That’s the power of plants! And three-quarters were off all their diabetes medications completely—in just six months’ time. And what are the side effects? How about LDL-cholesterol dropping 20%, triglycerides dropping nearly 40%—though, of course, anyone starting a strictly plant-based diet must ensure a regular, reliable source of vitamin B12. Whereas the more standard diabetic-diet group got a day like this: low-fat milk, whole wheat bread, kind of a Mediterranean lunch with vegetables and beans, fruit for a snack, and a bean-and-vegetable soup, whole grain bread, and baked fish. I have to say that’s a pretty healthy control diet. I mean, they could have compared it to some trashy diet, but they wanted to be like look, this is what the diabetes groups say is best, so let’s stack our diet against theirs. Okay, so what happened? The macrobiotic diet won out on every measure of blood sugar control. They all started out with fasting blood sugars in the 120s. That’s bad, but they were, after all, diabetics. Normal fasting blood sugars, like when you wake up in the morning before breakfast, should be at least down in the double digits, under 100. When they put people on this relatively healthy Diabetes Association diet, their blood sugars got better over the three-week study, from the 120s down into the one teens. So, that’s like the best the official diabetes-recommended diets can do. And, just as an aside, what a poke in the eye with a sharp stick this study was to the low-carb crowd. They took diabetics and put them on a 73% carbohydrate diet, adding a hundred grams of carbs to their daily diet, and in the form of grains. And what happened? Did their blood sugars skyrocket out of control? No, they got better—significantly better in a matter of days, with average fasting blood sugars starting out at 129, falling to 95, and, holy moly, their LDL cholesterol, down to 62, a nearly 48% drop, in three weeks. We would love it if you could share with us your stories about reinventing your health through evidence-based nutrition. Go to NutritionFacts.org/testimonials. We may share it with our social media to help inspire others. Be sure to check out my new “How Not to Die Cookbook”. It’s beautifully designed, with more than 100 recipes for delicious and nutritious plant-based meals, snacks and beverages. All proceeds I receive from the sale of all my books go to charity. NutritionFacts.org is a nonprofit, science-based public service, where you can sign up for free daily updates on the latest in nutrition research via bite-sized videos and articles. Everything on the website is free. There’s no ads, no corporate sponsorship. It’s strictly non-commercial. I’m not selling anything. I just put it up there as a public service, as a labor of love—as a tribute to my grandmother – whose own life was saved with evidence-based nutrition. Podcasts are good but where is list of ‘sources’ with cited studies? It’s part of what sets NFO apart from so many others and (some who charge for access to their study sources.) Please add them to keep the integrity of the NFO site consistent. Same with guest article writers. He cites the videos the sentences come from and the videos do have the sources linked to them. Click on the links and go to the videos. I am Italian and I know dr. Mario Pianesi, author of the studies cited in this podcast. I can confirm, from personal experience, that since when I started to eat this way, I feel much better and more energic. It must be fun to see the research from a person you know. Glad it has helped you. High five to the researchers.